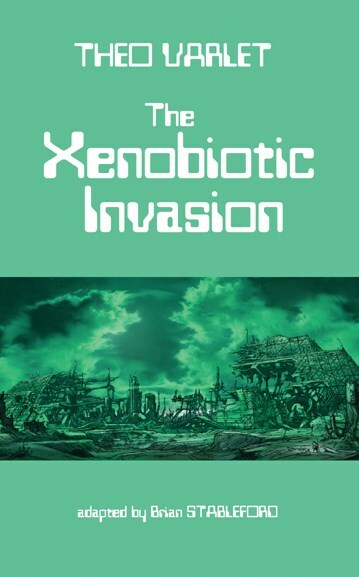 The Xenobiota had invaded the tracks; a vehement thrust of the extraterrestrial creation was developing aggressive battalions of lichen on the rails, a reddish-purple coating bristling with spikes, like a giant crystallization. In the vault, packets of branched stalactites were hanging from the trolley-wires and the feeder cables. Prolongations of these vegetal masses were surging forth, developing like the sections of an expanding telescope. After a brief interval, a blood-red bubble formed at the tip, which burst with a noise like a pop-gun, projecting its dust of spores. Aurore Lescure, the first woman astronaut to have gone into space, returns to Earth with deadly alien spores which feed on electricity and threatens to utterly destroy our civilization. Theo Varlet's 1930 novel shows the influence of J.-H. Rosny Aîné's classic disaster story The Mysterious Force (1913) and Henri Allorge's award-winning The Great Cataclysm (1922), both available from Black Coat Press. It is an exhilarating thriller which extrapolates ideas about dangerous alien lifeforms with considerable verve and polish, and foreshadows many similar-themed novels of the 1950s. Introduction and Notes by Brian Stableford.